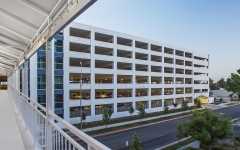 IPD’s second parking structure for the Community Regional Medical Center is located west of the first structure which was completed in 2009. 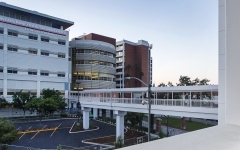 The Clark Parking Structure is situated adjacent to railroad tracks and faces the hospital’s trauma center, with a public street separating the two buildings. 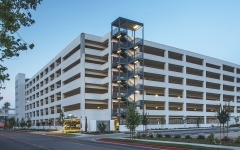 The new structure provides dedicated parking for hospital employees and staff. The first level of the garage features a decorative security screen which is used on three sides for safety and visual enhancement. Open stairways and glass-backed elevators are located close to the pedestrian destination. At the roof level, the stairways and elevator lobby feature canopy roofs for shade and rain protection. Infrastructure has been designed for future photovoltaic panels at the roof level. Security cameras are located throughout the interior and exterior of the structure. Sustainable features include active and future electric-vehicle charging stations, free-standing bicycle storage in a secured enclosure, and LED lighting.